Dragon Age: Inquisition is launching soon and players can get ready for its release with a free program from BioWare called Dragon Age Keep. This program enables players to carry over their decisions from Dragon Age: Origins and Dragon Age 2. Inquisition can't directly import saves from the games that came before it. It doesn't matter if you've been using the same EA/Origin account throughout the whole trilogy or you've been using the same platform. Some information from your saves can be harvested by Dragon Age Keep. Keep mainly seems to draw data from your heroes from the two games and that's about it. You'll still have to fill in some gaps. Also, if you regret any choices you made throughout the Dragon Age series, this is your chance to fix them. There are two ways to use Dragon Age Keep. You can watch an animated retelling of the events of Origins and DA2, and make choices as they pop up in the story. For example, you could decide to spare a character or execute them - just as you would if you were playing the actual game. This interactive story doesn't cover everything across the two games and their various DLC packs. However, it will give you a brief overview of the plot if you either forgot the details or are new to the series. Also, it allows you to relive the most crucial decisions from the two games. 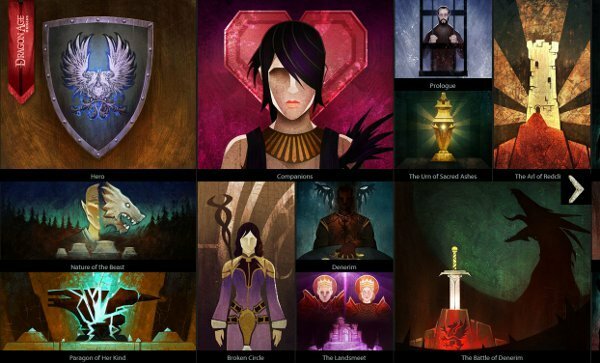 If you're more obsessive about your Dragon Age experience, you can check out the interactive tapestry depicting your choices. There are over 300 decisions represented here and you can change each of them. Each choice is accompanied by a bit of background information to help you along. Once you're done mapping out your decisions, you can click the globe icon on the top right corner of Dragon Age Keep to save and export it to Dragon Age: Inquisition. When you start a new Inquisition play-through, you'll be able to choose your custom world(s) or a default one. "You can create and save up to 9 world states in the Keep (though we are looking at increasing that number to 10)," BioWare said in the FAQ for Keep. "So for example, if you want to create a Darkest Timeline where everyone dies, you can." Dragon Age Keep can be found here. You can sign in with any browser, though BioWare recommends Chrome on desktop for your first visit. The website also works on mobile devices. You'll need an Origin account in any case. Also, they recommend disabling addons like AdBlock or Ghostery for the site as they prevent the Feedback Tool from appearing. Dragon Age: Inquisition will launch on PS4, PS3, Xbox 360, Xbox One and PC on November 18th in North America and on November 21st in Europe.